Nokia today unveiled the entry-level Nokia 510 smartphone. 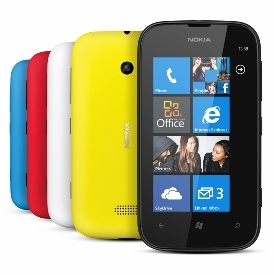 The new Windows Phone 7.5 handset sports a 4-inch display and offers five color options: red, yellow, cyan, white, and black. It will cost $199 and is expected to launch in India and China in November, followed by Asia-Pacific and South America. The phone will run on a Snapdragon S1 processor and includes 256MB of RAM, 4GB memory (with no external memory card access), and 7GB of free SkyDrive storage. The touch screen's 800-by-480 display can show off photos taken with the 5-megapixel, rear-facing camera. The Lumia 510 will feature the Windows Phone Live Tiles, People Hub, as well as access to Microsoft Office and Internet Explorer 9. Unique Lumia features like the Camera Extras app for digital lens functionality, as well as Nokia Maps, Nokia Drive, and Nokia Transport, will also be included, providing comprehensive location and navigation. "People who use Windows Phone quickly realize how much more intuitive it is than other smartphone platforms," Jo Harlow, executive vice president of Nokia Smart Devices, said in a statement. "With the Nokia Lumia 510 we're looking forward to welcoming more people into the Windows Phone experience." The new smartphone follows in the footsteps of Nokia's Lumia 610, announced in February, which sports a 3.7-inch display but 8GB of memory. PCMag mobile analyst Sascha Segan called it "pretty, but definitely slower" than most Windows Phones. In the U.S., the Nokia Lumia 820 and 920 will be the next major Windows Phone releases; they will sport the upgraded Windows Phone 8 OS, which will be formally released during a San Francisco event on Monday. PCMag will be there, so stay tuned for all the details.